Visualization: a three-dimensional computer model looks much more colorful than a 2D drawing. 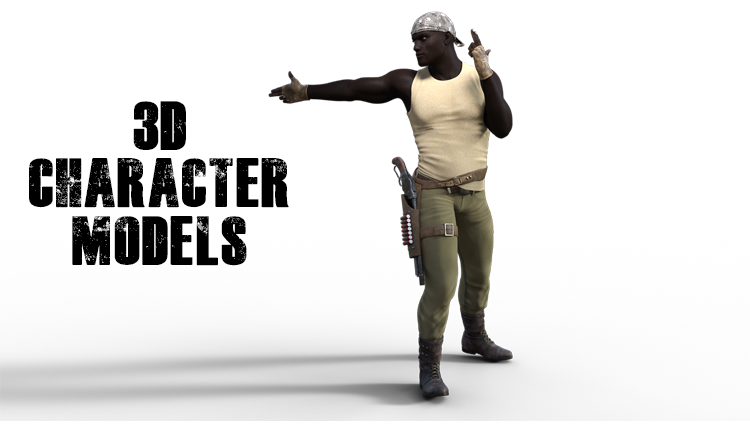 Most of character 3D models are used during the game development for PC, consoles or mobile devices. Characters of all the most famous games are made using 3D modeling and animation. Among them, the heroes of Call of Duty, Wiedźmin (Witcher), Fallout, Portal, Assassin’s Creed, Resident Evil, The Legend of Zelda, Battlefield, Mass Effect, Far Cry, Prince of Persia, Deus Ex, Diablo. 3D modeling becoming more popular each year in cinema creation – movies and cartoons are full of 3D characters. Sometimes such characters are fully hand-modeled, and then animated with the help of software. In other variations, the character 3D model haves “motion” with the help of the Motion Capture technology. Programs for character 3D models creation are also called for digital sculpture software. ZBrush arms the modeler with a brush, which draws using strokes with depth. In addition to the 3D modeling it is possible to paint an object too. An important advantage of the program is an automatic addition of shadows and glare, which looks natural without the intervention of the modeler. The rendering process usually takes place in real time and the artist immediately sees the result of the work. One of the few free editors to create 3D models of characters. Despite this, it is used for commercial projects – films and animation, including “Big Buck Bunny” and “Sintel”. The program also has a modeling mode, allows you to create skeleton animation, has the function of creating games. Autodesk offers a large selection of programs for creating characters 3D models and animations that have similar functions (3Ds Max, Maya). However, Mudbox is a specialized program that provides artists with an intuitive set of tools for creating and modifying high-poly 3D characters. Reminds working with clay and paints. Creating a 3D character models in 3DMax and other programs from Autodesk requires the modeler to have professional skills and a deep understanding of the principles of the program itself. Therefore, the software for 3D modeling from Autodesk is not recommended for novices. It has a simple interface and at the same time it supports animation and rendering of high quality. The MOCCA package is specifically designed to work with characters and includes a set of tools that allow you to create animations and transfer the dynamics of soft and hard bodies. The program has a module for working with realistic hair and a built-in particle management system.